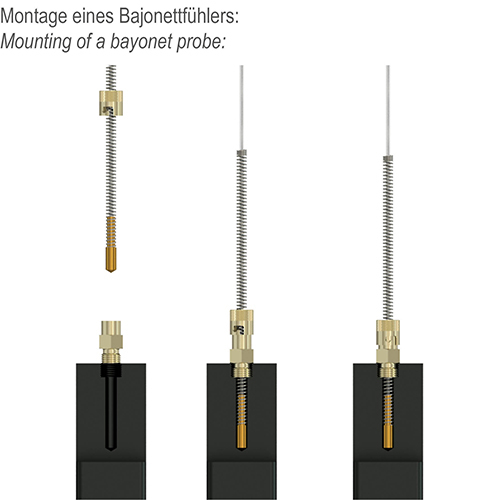 Temperature probes with bayonet joint are perfectly suited for mointing in blind holes. Thanks to the special measuring tip the bayonet probes are particularly suitable for use in flat and pointed holes. The dimensionally stable spring guarantees a constant contact pressure of the measuring tip in the hole and serves as cable sleeve support. The fitting length can be varied according to demand due to the adjustable bayonet joint. 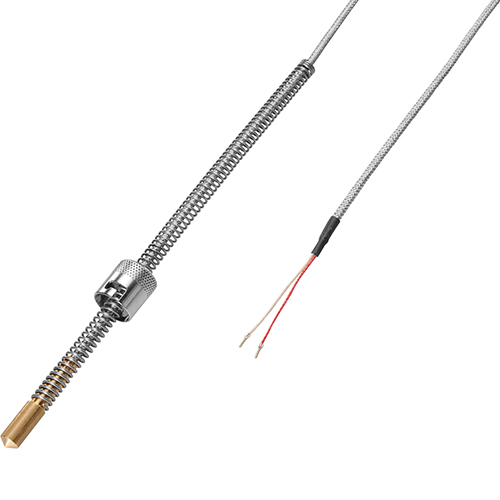 This temperature probe is mainly used in the plastics industry. You can also order our bayonet probes with different sensors e.g. with a thermocouple type K or type J or totally customer-specific. Please do not hesitate to send us your request.